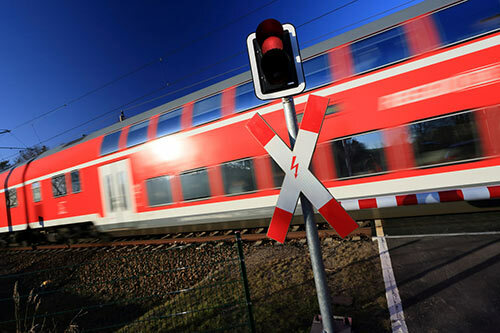 Railway signaling and switching systems are crucial for safe and smooth operation of the entire railway system. The train driver relies on functioning signals and signal system uptime allows for increased passenger volume. Bender can detect faults in the cabling quickly and cost-effectively during operation using an ISOMETER® ground-fault monitoring device and locate them automatically by means of ground-fault location systems. Downtimes are reduced and maintenance can be planned proactively. The switching points are controlled from the signal box. If a ground fault occurs in the connection between the signal box and the points, this can be detected and reported very early by means of a Bender ISOMETER®. Thereby, downtimes can be minimized and the condition of the insulation can be continuously monitored for increased levels of safety and reliability at all times. Failure of the track heating in winter leads to unnecessary interruptions to operation and passenger or freight delays. Monitoring the controllers of track switch heating locations for faults, energy quality, energy requirements and load currents using measuring and monitoring relays enables continuous operation without disconnection. While the system is out of operation, monitoring is carried out as continuous offline measurement, providing increased levels of safety at all times. Railway crossings are made safe by technical equipment. The train triggers the gates to open or close by driving over sensors. Failure of this safety equipment would bring the train to a stop or block crossing traffic. Securing with fault current monitoring devices or ground-fault monitoring devices helps avoid these problems. The automatic train control system is a system which transfers drive parameters or drive orders to the train driver based on which they are to drive their vehicles. It also allows the monitoring of the driving behavior of trains, especially at maximum speed. If necessary, it intervenes into the vehicle controller to initiate braking in order to avoid excessive speed. Automatic train control systems can also be used for fully automated control of the driving and braking processes of trains. There is inductive data transfer between the vehicle and the travel route by means of a pair of cables laid between the rails (known as the line conductors). The power for each section is supplied via an ungrounded system which is monitored using special ISOMETER®s. The power supply of the ATCS along the tracks is also set up as an ungrounded system and requires continuous ground-fault monitoring to avoid unplanned interruption of control. Emergency and safety lighting at passenger train stations as well as track field illumination may be operated via ungrounded power supplies. Ground-fault monitoring devices continuously monitor the condition of the insulation. Grounded system parts can be monitored for faults using residual current monitors. Switching to a redundant power supply can be done via the ATICS® product.